162 posts categorized "Internet Access"
Do you use broadband internet from Verizon FiOS? Or are you considering it? The blazing speed is awesome for viewing video content online, but I found portions of the service less than awesome. Which portions? The view/pay bills section of the secure site. Third, the presentation lacked features to print, save, or delete individual messages. The presentation also lacked a sort feature. That's not state-of-the-art. Strangely, the profile section of the site includes a slightly better presentation of messages with dates and read/unread status. So, Verizon knows how to do it, but seems to have decided not to for this site section. Why deviate? Why not simply link to the profile messages section and display all messages in the profile section? You have choices about Verizon's use and sharing of certain information for the purpose of marketing new services to you. Verizon offers a full range of services, such as television, telematics, high-speed internet, video, and local and long distance services.Unless you notify us as explained below, we may use or share your information beginning 30 days after the first time we notify you of this policy. Your choice will remain valid until you notify us that you wish to change it, which you have the right to do at any time. Verizon protects your information and your choices won't affect the provision of any services you currently have with us.¿Customer Proprietary Network InformationCustomer Proprietary Network Information (CPNI) is information available to us solely by virtue of our relationship with you that relates to the type, quantity, destination, technical configuration, location, and amount of use of the telecommunications and interconnected VoIP services you purchase from us, as well as related billing information.We may use and share your CPNI among our affiliates and agents to offer you services that are different from the services you currently purchase from us. If you don't want us to use or share your CPNI with our affiliates and agents for this purpose, let us know by calling us any time at 1.866.483.9700.¿Information about Your CreditInformation about your credit includes your credit score, the information found in your consumer reports and your account history with us. 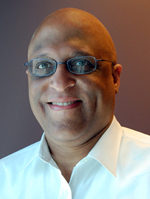 We may share this information among the Verizon family of companies for the purpose of marketing new services to you. If you don't want us to share this information among the Verizon family of companies for the purpose of marketing new services to you, let us know by calling us any time at 1.844.366.2879." If you like online privacy, then opting out of these programs is wise. Regular readers of this blog are familiar with CPNI disclosures from AT&T, and how much that information describes about the specific telecommunications services you use and your associated spending. 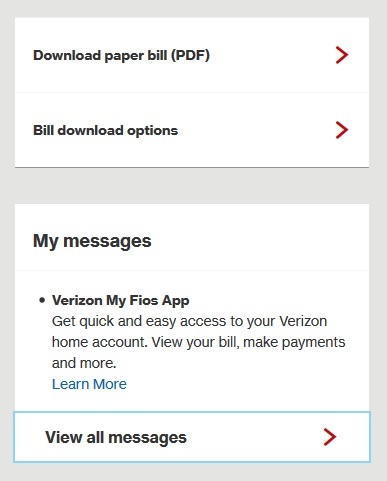 The failure to display a date makes it impossible for consumers to determine whether or not the 30-day deadline has passed (and Verizon FiOS has already begun sharing customers' information). Not good. 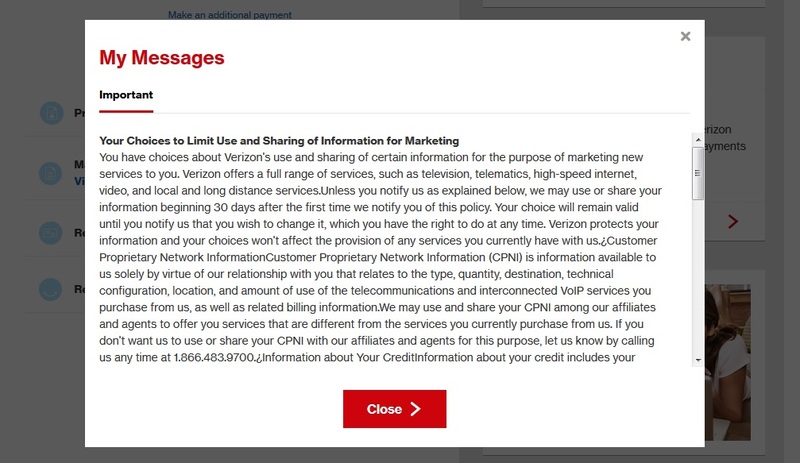 Note: the program default automatically includes customers in Verizon's data-sharing programs after 30 days. A better default would be to not include all customers, and then only include customers who opt in or register. Is this lazy or slick marketing? Probably a little of both since most consumers fail to read legal messages. Fifth, what's with the funky syntax (e.g., upside-down question marks)? This is English, not Spanish. Sixth, the message presented information as a "wall of words" without paragraph breaks, imagery, or other mechanisms to improve readability. There should be paragraph breaks before both "CreditInformation" and "Customer Proprietary Network Information" -- two critical concepts requiring customers' attention. Seventh, the opt-out mechanism includes two different phone numbers to fully opt out of the data-sharing programs. Why the complexity? Come on, Verizon. You can do better. You are the phone company. Is a single phone number too difficult? Why put your customers through this hassle? Even worse: the site fails to provide an online opt-out mechanism. What's up with that? Come on Verizon! You can do better. This poor message display and cumbersome opt-out mechanism makes it easier for Comcast Xfinity. Is that really what you want to do? I think not. Hopefully, FiOS customers will hear from Verizon in the comments section below. If they write to me separately, I'll post that response. To me, the unnecessary (and avoidable) complexity seems like slick attempts to discourage customers from opting out of the data-sharing programs. What do you think? "When the 9th U.S. Circuit Court of Appeals ruled, in September 2016, that the Federal Trade Commission did not have the authority to regulate AT&T because it was a “common carrier,” which only the Federal Communications Commission can regulate, the decision created what many in privacy foresaw as a “regulatory doughnut hole.” Indeed, when the FCC, in repealing its broadband privacy rules, decided to hand over all privacy regulation of internet service providers to the FTC, the predicted situation came about: The courts said “common carriers” could only be regulated by the FCC, but the FCC says only the FTC should be regulating privacy. So, was there no regulator to oversee a company like AT&T’s privacy practices? Indeed, argued Gigi Sohn, formerly counsel to then-FCC Chair Tom Wheeler, “The new FCC/FTC relationship lets consumers know they’re getting screwed. But much beyond that, they don’t have any recourse.” Now, things have changed once again. With an en banc decision, the 9th Circuit has reversed itself... This reversal of its previous decision by the 9th Circuit now allows the FTC to go forward with its case against AT&T and what it says were deceptive throttling practices, but it also now allows the FTC to once again regulate internet service providers’ data-handling and cybersecurity practices if they come in the context of activities that are outside their activities as common carriers." Somebody has to oversee Internet service providers (ISPs). Somebody has to do their job. It's an important job. The Republicans-led FCC, by Trump appointee Ajit Pai, has clearly stated it won't given its "light touch" approach to broadband regulation, and repeals last year of both broadband privacy and net neutrality rules. Earlier this month, the National Rifle Association (NRA) honored FCC Chairman Pai for repealing net neutrality rules. "No touch" is probably a more accurate description. A prior blog post listed many historical problems and abuses of consumers by some ISPs. Consumers should buckle up, as ISPs slowly unveiled their plans in a world without net neutrality protections for consumers. What might that look like? What has AT&T said about this? "Net neutrality has been an emotional issue for a lot of people over the past 10 years... For much of those 10 years, there has been relative agreement over what those rules should be: don’t block websites; censor online content; or throttle, degrade or discriminate in network performance based on content; and disclose to consumers how you manage your network to make that happen. AT&T has been publicly committed to those principles... But no discussion of net neutrality would be complete without also addressing the topic of paid prioritization. Let me start by saying that the issue of paid prioritization has always been hazy and theoretical. The business models for services that would require end-to-end management have only recently begun to come into focus... Let me clear about this – AT&T is not interested in creating fast lanes and slow lanes on anyone’s internet." "AT&T is talking up the benefits of paid prioritization schemes in preparation for the death of net neutrality rules while claiming that charging certain content providers for priority access won't create fast lanes and slow lanes... What Quinn did not mention is that the net neutrality rules have a specific carve-out that already allows such services to exist... without violating the paid prioritization ban. Telemedicine, automobile telematics, and school-related applications and content are among the services that can be given isolated capacity... The key is that the FCC maintained the right to stop ISPs from using this exception to violate the spirit of the net neutrality rules... In contrast, AT&T wants total control over which services are allowed to get priority." "... AT&T provides only DSL service in many rural areas, with speeds of just a few megabits per second or even less than a megabit. AT&T has a new fixed wireless service for some rural areas, but the 10Mbps download speeds fall well short of the federal broadband standard of 25Mbps. In areas where AT&T has brought fiber to each home, the company might be able to implement paid prioritization and manage its network in a way that prevents most customers from noticing any slowdown in other services..."
So, rural (e.g., DSL) consumers are more likely to suffer and notice service slowdowns. Once the final FCC rules are available without net neutrality protections for consumers and the lawsuits have been resolved, then AT&T probably won't have to worry about violating any prioritization bans. The bottom line for consumers: expect ISPs to implement first changes consumers won't see directly. Remember the old story about a frog stuck in a pot of water? The way to kill it is to slowly turn up the heat. You can expect ISPs to implement this approach in a post-net-neutrality world. (Yes, in this analogy we consumers are the frog, and the heat is higher internet prices.) Paid prioritization is one method consumers won't directly see. It forces content producers, and not ISPs, to raise prices on consumers. Make no mistake about where the money will go. Consumers will likely see ISPs introduce tiered broadband services, with lower-priced service options that exclude video streaming content... spun as greater choice for consumers. (Some hotels in the United States already sell to their guests WiFi services with tiered content.) Also, expect to see more "sponsored data programs," where video content owned by your ISP doesn't count against wireless data caps. Read more about other possible changes. Seems to me the 9th Circuit Appeals Court made the best of a bad situation. I look forward to the FTC doing an important job which the FCC chose to run away from. What do you think? "1. Escape Advertising Tracker Networks: Our Privacy Protection will block all the hidden trackers we can find, exposing the major advertising networks tracking you over time, so that you can track who's trying to track you. 2. Increase Encryption Protection: We force sites to use an encrypted connection where available, protecting your data from prying eyes, like internet service providers (ISPs). 3. Search Privately: You share your most personal information with your search engine, like your financial, medical, and political questions. What you search for is your own business, which is why DuckDuckGo search doesn't track you. Ever. 4. Decode Privacy Policies — We’ve partnered with Terms of Service Didn't Read to include their scores and labels of website terms of service and privacy policies, where available." "As you search and browse, the DuckDuckGo Privacy Browser shows you a Privacy Grade rating when you visit a website (A-F). This rating lets you see how protected you are at a glance, dig into the details to see who we caught trying to track you, and learn how we enhanced the underlying site's privacy measures. The Privacy Grade is scored automatically based on the prevalence of hidden tracker networks, encryption availability, and website privacy practices. Our app provides standard browsing functionality including tabs, bookmarks, and autocomplete. In addition to strong Privacy Protection as described above, we also packed in some extra privacy features into the browser itself: a) Fire Button — Clear all your tabs and data with one tap; b) Application Lock: Secure the app with Touch ID or Face ID." The Privacy Grade ratings reminds me of the warnings provided by the Privacy Badger add-on, which alerts consumers to the tracking mechanisms used by sites, and provides consumers finer control about which mechanisms to enable or disable at each site.